The controversial, outspoken editor of Hawaii Free Press has now formed a PAC "to undermine the culture of political impunity." Earlier this fall I participated in a Think Tech Hawaii forum at the Laniakea YWCA downtown. Billed as a “blue ribbon panel” discussion on the “post-Inouye/Abercrombie era” in Hawaii politics, the forum also featured Daryl Huff of Hawaii News Now, Beth-Ann Kozlovich of Hawaii Public Radio, Malia Zimmerman of Hawaii Reporter and Colin Moore of the University of Hawaii Political Science Department. It was the inclusion of Andrew Walden of Hawaii Free Press on the panel that raised a few eyebrows. Several people asked me if it was not such a good idea to appear on the same dais with Walden. They expressed their concerns about his journalistic bona fides and political slant. I responded that perhaps Think Tech Hawaii meant to say it was a Pabst Blue Ribbon panel, but the joke fell flat. What it made me start thinking about is just why Andrew Walden gets under the skin of so many people. 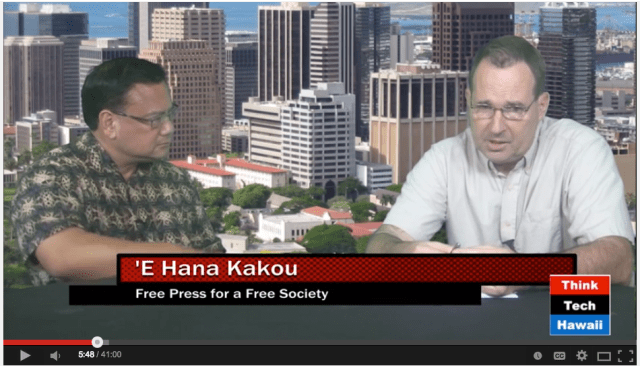 Kelii Akina of the Grassroot Institute, left, with Andrew Walden in an Aug. 10 video discussing current events in Hawaii and the importance of the free press. Some of those reasons were evident at the Sept. 24 forum. While there were those in the audience who were delighted to see a conservative iconoclast offering a different take on Hawaii politics — Walden has been involved with the Hawaii Republican Party, the Libertarian-leaning Grassroot Institute of Hawaii and local tea party groups — others scratched their heads at Walden’s occasional cryptic references to local politicians. Asked about our newest U.S. senator, for example, Walden encouraged people to Google “Brian Schatz” and “sheep.” The reference, it seems, is to an online post last year claiming to report on the college-age Schatz and a fraternity prank. Perhaps Walden was seeking laughs from the audience, but I don’t know. My interpretation was that Walden seriously wanted people to Google “Brian Schatz” and “sheep” as a way to form a negative opinion on Hawaii’s senior senator. Walden’s remark on Schatz is minor, though, compared with some of his other comments. And whether you agree with him or not, he has become a presence on the local political landscape and is having an influence. 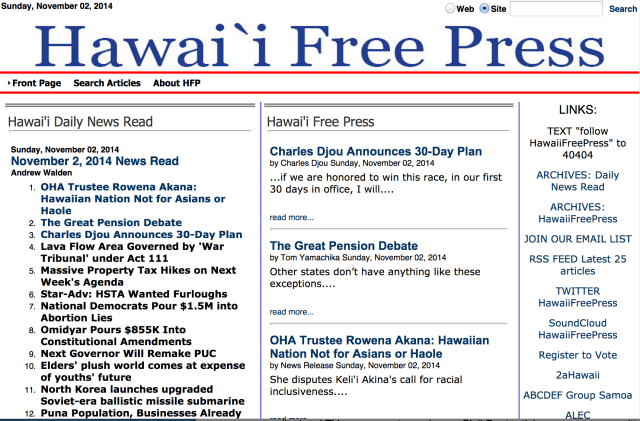 Walden is not shy about expressing his opinions, and with Hawaii Free Press they have gained a sizable audience. The post on Ige is typical of many of Walden’s writings on local politics. They have just enough of a veneer of authority to make some readers take them to be credible, and they often do raise legitimate questions about issues like conflict of interest. But the articles can also be misleading. The links Walden provides in the Ige story — to a “small-time jewel smuggler” and “Larry Mehau protectee” — raise old, largely unsubstantiated rumors about Mehau being a criminal “Godfather” and make Ariyoshi, a three-term governor, somehow guilty by association. The link to the “Conflict of Interest” story, meanwhile, is to a 1988 article in the Honolulu Star-Bulletin article that is much less of an indictment on Ige than Walden suggests. The actual headline for the story — “Sen. Ige now a GTE lobbyist: He says he will avoid a conflict of interest and not lobby his peers” — is far more benign the the accusatory headline Walden provides. Screen shot Nov. 2, 2014. Sometimes, Walden reports on things before reporters in the mainstream press have, albeit in a manner that suits his political agenda. But even people who might be expected to have similar political views are not happy with Walden’s work. Just this fall, Walden took his political activism a step further, creating his own political action committee. Called the Hawaii Voter Initiative Project, it has spent more than $14,000 on voter lists, mailers and postage to target five Democrats running for the Hawaii Legislature. “The Hawaii Voter Information Project is a 100 percent self-funded effort to undermine the culture of political impunity,” he told me in an email Sunday. Walden agreed to an interview on the condition that I email my questions to him. 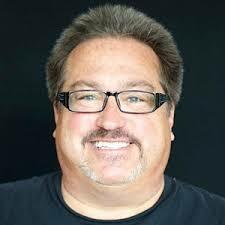 Originally from Detroit, Walden, 52, started Hawaii Free Press about 10 years ago on the Big Island. It is reported to have 40,000 online subscribers. Walden lived in Hilo until moving to Oahu a few years ago. In addition to his own writings, he publishes lots of press releases, many of them from the Republican Party of Hawaii and Kelii Akina, who leads the Grassroot Institute and is on the ballot Tuesday running to be an Office of Hawaiian Affairs trustee. Walden has not limited his activity to his website. For instance, he was a key force in persuading Hawaii Republicans to have a presidential caucus in 2012. Having written about the need for Hawaii Republicans to involve more people in the presidential selection process “in order to expand voter participation and thereby move closer towards a two-party system in Hawaii,” Walden explained, the party saw 10,000 voters participate in the nomination of Mitt Romney two years ago. As a result of the caucus, Walden said 1,400 new Hawaii voters were registered. Under state GOP rules, the next presidential caucus will be March 8, 2016. Those issues involve supporting a nuclear family, the military, religion and religious values. Walden also opposes the Jones Act on maritime shipping, wants to repeal Obamacare, supports gun ownership, seeks strong sentencing for criminals and would like to decrease the power of Hawaii’s labor groups. In certain circles, those views are not uncommon even in Democrat-dominated Hawaii. But Walden’s Internet bully pulpit has got him the attention of powerful forces, like the state’s largest union, the Hawaii Government Employees Association. 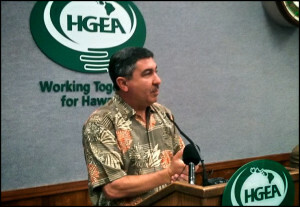 Randy Perreira, HGEA executive director. Speaking at the HGEA’s general assembly in May, Executive Director Randy Perreira spoke proudly about the union’s successful efforts to block a bill to privatize the Hawaii Health Systems Corporation, which employs a lot of unionized workers. The profane phrase that followed concluded remarks that were received with sustained whoops and applause from the membership. Walden’s PAC, the Hawaii Voter Information Project, is targeting five Democrats in the general election: state Sen. Brickwood Galuteria, Reps. Tom Brower, Karen Awana and Richard Creagan, and former state Rep. Mike Magaoay. The practice of pulling quotes from the media out of context to use in political attacks is nothing new. Neither is the reaction to them. Magaoay is seeking to unseat Republican Lauren Cheape Matsumoto. Galuteria and Brower, whose districts included Waikiki, say they are not happy with the mailers targeting them but are doing what they can to fight back. As in the trash can. Still, Galuteria says the mailers have forced him to ramp up his campaign and send out mailers of his own attempting to set the record straight. For his part, Walden feels it is entirely appropriate to point out what he says were statements in the media about candidates. “Will the information in one mailer be enough to stand out in the pre-election deluge? We will find out soon,” he said. It is appropriate to re-publish news. To do so legally in this context requires a PAC. Unlike the dozens of Hawaii journalists (shall I make a list?) who go back and forth through the revolving door to work on the payroll of politicians, billionaires, developers, government departments, or other special interests, I am completely independent of external control or funding. If his PAC is successful, Walden may keep it going. Stay plugged in to campaigns and candidates this election season with Civil Beat’s Hawaii Elections Guide 2014, your source for information on federal, state and local elections. Click here for a list of candidates with links to their views on questions and issues posed by Civil Beat.